What’s coming for Back to School Tax Free Weekend 2017? Find out here. Alabama Tax Free Weekend 2017 – Alabama’s Back to School event begins July 21st through July 23rd, 2017. It is for clothing, computers, school supplies. See full details here. Mississippi Tax Free Weekend 2017 – MS Back to School Sales Tax Holiday begins July 28th through 29th, 2017. It is only on clothing & footwear. Full details. Tennessee Tax Free Weekend 2017 – TN Back to School Three Day Tax-Free Event goes from Friday, July 28th to Sunday July 30th, 2017. TN’s Tax Free Event covers clothing, school supplies, computers. The weekend of August 4th features 10 Tax Free Weekends. Florida Tax Free Weekend – August 4-6th, 2017 covering school supplies, clothing, computers. details. As well as Ohio, Virginia, South Carolina, Oklahoma, New Mexico and Missouri. Iowa and Louisiana of the August 4th Tax Free Weekends, are only two days ending on August 5th, 2017. Arkansas is the odd ball of the first weekend of August Tax Free Weekends being only from August 5th through August 6th, 2017. Texas Tax Free Weekend is August 11th through August 13th, 2017. It features tax-free savings on clothing, backpacks & school supplies. TX details here. 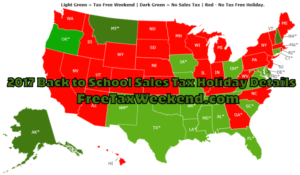 Two states offer week long tax free savings for back to school shoppers. Maryland offers tax-free savings on clothing and footwear from August 13th through 19th, 2017. Maryland Sales Tax Holiday details here. Connecticut Tax Free Week 2017 will begin on August 20th and the 26th. Clothing and footwear is also tax-free during this event. Full CT Tax Free Weekend details here. States who planned for a tax free weekend, but no legislature was passed for the event. States with no sales tax list can be found here. This has been pretty much everything there is to know about the 2017 Back to School Tax Free Weekend. Check out our main page for constant updates on Tax Free Weekends.